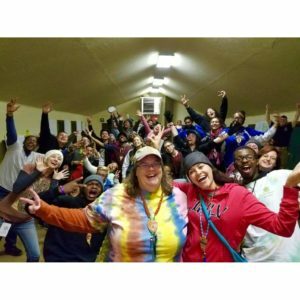 Camp Anytown is a nationally recognized, award-winning, 45 year-old training program for youth in leadership skills, human relations, and diversity. With its historic roots as part of the NCCJ, ANYTOWN works from the premise that we live in a multicultural society and that young people are the nation’s future. Therefore, youth need to be sensitized to the experiences of diverse groups if, as decision makers, they are expected to make fair judgments in improving the quality of life for the entire nation regardless of ability, ethnicity, faith/religion, and gender. By direct exposure of participant’s to such differences and by offering them opportunities to learn and work together, greater acceptance may be promoted through better understanding of people’s beliefs, traditions, and behaviors. Each ANYTOWN serves as a proving ground where individuals can be changed into persons who can deal more effectively with the multicultural society in which we live by learning to create communities that are inclusive and which honor and respect every person. The goal of ANYTOWN is to foster an environment in which education, dialogue, and interaction among the delegates results in increased self-esteem, mutual respect, understanding, and acceptance of all cultures, ethnic groups, faith/religions, and genders. To learn about prejudice and discrimination and their effects on others within our society. To nurture a sense of individual self-worth through recognition of ability, culture, ethnicity, faith/religion, and gender as integral parts of one’s identity and its important role in the multicultural character of U.S. society. To encourage the acceptance and appreciation of people from different backgrounds in ways that enhances co-existence, cooperation, and interdependence in a community. To promote the development of leadership skills vital in the conduct of, and full participation in, a multicultural democracy. Increased awareness and understanding of the multicultural make-up of U.S. society including: ability, ethnicity, faith/religion, and gender. Camp Anytown is a three-day intensive experience. Youth go up to the campsite Friday morning and return home Sunday evening. Each camp serves 60-65 youth from throughout Las Vegas who are referred by their school counselor and/or teachers or a community agency that provides services to youth. Camp participants reflect the diverse make-up of our city so that youth have an opportunity to learn and grow from their experiences with others who may be different from themselves. The Interfaith Council of Southern Nevada is the host organization for Camp Anytown. The Interfaith Council does not sponsor any particular religious belief or tradition. It is part of the IFCSN mission to convene groups that encourage appreciation of differences without any coercion to participate in any ritual or to be proselytized. During Camp Anytown, delegates have an opportunity to learn about various religious traditions from their fellow campers. This is part of the total program that addresses numerous areas where misunderstanding and discrimination occur, including the topics of ability, ethnicity/culture, and gender. As the initiating organization of the Camp Anytown program, the IFCSN aims to be a resource to the community in combating bias, bigotry, and discrimination in all forms.